Are you not beta testing PA's Prospector for keeping your online stats? Thought I a saw your request at PA. The only low stakes pro I know is Poker Grump. he does respond to emails, so you might want to shoot him your questions. He's a pretty thorough-going type, so be as much of a nit as you want to be. As for the crime scene game, in that this happens to you quite often there, what are you doing wrong? Not raising enough prefolp? Do you suppose they have a read on you? Do you need to change up? @civi: PA has not deigned to respond to my request to be a beta tester. @bastinptc: I appreciate your questions about the Crime Scene game. The biggest mistake I'm making is paying off when people make their ridiculous hand. The problem is: I can't just fold every time someone makes a humongous river bet. 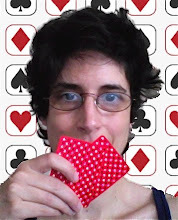 The other problem is: going 40 or more hands in a row without hitting a flop. You just can't bluff enough to compensate for that. Then simply stop bluffing. When I hit a downturn, I go back to PAO and play ABC poker (you'll be able to get what I like to call 'touched by the donk' tilt out of your system). Don't forget that you want those idiots that hit their super duper mega happy 52o hand to your KK, QQ. Over the long haul, you'll mop the floor with them. Remember the long term. You're a very good read.